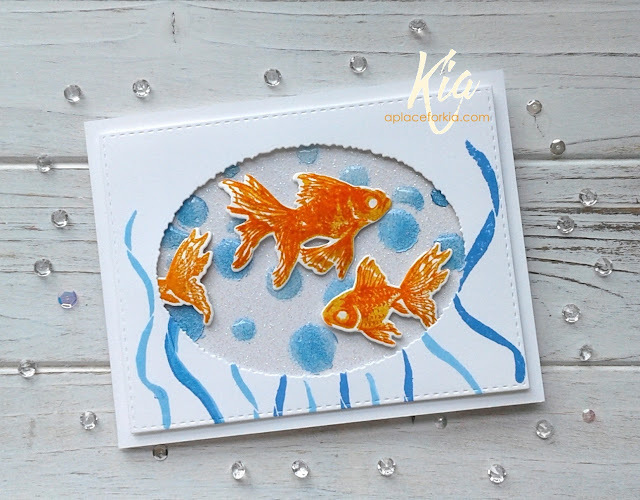 This is just the cutest goldfish ever, and I could not resist using it and the seashell corners from Art Neko on my card today. I started this card first by laying the design out in my Misti to arrange the placement of the stamps. I die cut the stitched rectangle dies, one from cardstock, and the top piece from watercolour paper. 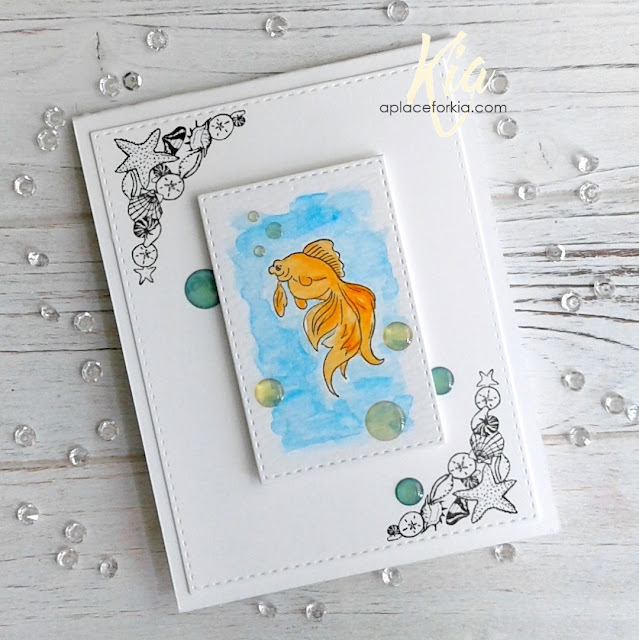 I then stamped the seashell corner on opposite corners of the cardstock and stamped the goldfish on the watercolour paper, which I then painted using Daniel Smith watercolours. I attached the bottom panel, then attached the watercolour panel on foam strips and finished by adding a few raindrops. This card has me smiling when I look at it, and I think it could be used for just about any occasion. I plan to use it for a birthday card. Thank you for visiting my blog today, I will see you next time. Products: Art Neko Ornamental Goldfish, Seashell Corner, Simon Says Stamp Stitched Rectangle, Neenah Cardstock, Ranger Watercolour Paper, Daniel Smith Watercolours, Simon Says Stamp Intense Black Ink, Foam Strips, Raindrops. This is the final card I made for the fall wedding, and this is for the Best Man. I wanted to include the blue and ivory pumpkins, and still keep it masculine. This is what I came up with. I used Neenah Desert Storm cardstock to accomplish the masculine look, dry embossing the top matting piece along with the top panel using a woodgrain embossing folder. To add more textures to the masculine card, I distressed the edges of the panel using my Zutter Distrezz-it-All machine, which makes that job so easy. I sponged navy along the distressed edges and attached to the card on foam strips. I then added the sponged die cut tree along with the pumpkins, which bring in the theme and other colours from the wedding. For the sentiment I die cut the label in the navy and stamped and heat embossed the sentiment with gold embossing powder. 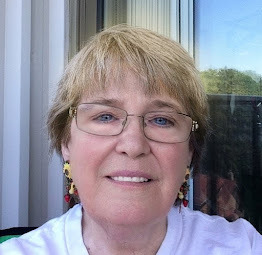 I so enjoyed making Carol's cards, and I am pleased she liked my ideas. Making for others in one of the joys of being a card maker. Thanks for visiting today ... see you next time. Products: Impression Obsession Bare Tree, Pumpkins from the Frantic Stamper Fall Harvest Panel Die, Tim Holtz Woodgrain Embossing Folder, Simon Says Stamp Thanks, Sugar Pea Tag Die, Zutter Distrezz-it-All, Neenah Desert Storm Cardstock, Bazzill Cardstock, Tim Holtz Distress Inks Chipped Sapphire, Altenew Persian Blue Ink, Gold Embossing Powder, Watermark Embossing Ink, Foam Strips. Summer has arrived, however in my neck of the woods it is a tad chilly. But, summer means watermelon to me! This was an easy card to make, all done inside my Misti. I stencilled the background using Clarity brushes deepening the colour around the area of the watermelon. I stamped and watercoloured the watermelon with my Zig brushes, die cut and propped it up on foam dots to the card base. I then stamped the sentiment and the ant tracks, but left off the ants as I did not want any today! A few drops of Nuvo Jewels finished my card, which I hope you enjoy. Thanks for visiting today, see you next time. Products: Lawn Fawn Happy Summer Stamp and Die Set, Memory Box Textured Diamond Stencil, Tim Holtz Distress Ink Shabby Shutters, Zig Brushes, Simon Says Stamp Intense Black Ink, Neenah Cardstock, Arches Watercolour Paper, Nuvo Jewel Drops. A couple of week's ago I shared a thank you card I did for a customer who is getting married in September. This is another thank you card done for Carol using the colours she will be using on her special day. until I was happy with the movement. I wanted a softer look, instead of the rough look Bisters can give, and I wanted it darker towards the bottom. Thankfully, it worked the way I wanted it to - just love it when that happens! Once my panel was dry I die cut using my stitched rectangle die and attached to my card base of foam strips. For the sentiment I stamped and heat embossed using gold embossing powder on 40lb vellum paper, then die cut the leaves from gold metallic paper. I played around with the arrangement until I was happy with the look and finished with sequins for a bit of sparkle. Thanks for having a look today. 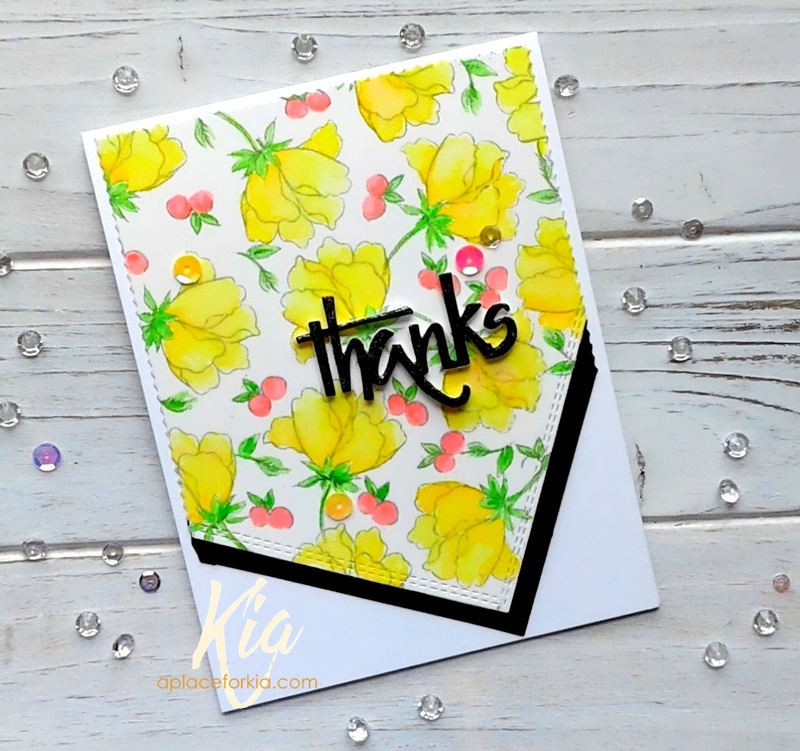 Products: Frantic Stamper Primitive Veined Leaves Die Set, WPlus9 Studio Designs Stamp Set, Simon Says Stamp Stitched Rectangles, Bister Powders, Gold Embossing Powder, Neenah Cardstock, Fabriano Hot Press Watercolour Paper, Gold Metallic Cardstock, Vellum 40lb., Sequins, Foam Strips. While making this card I was thinking of my friend's granddaughter. She is the age now where she would love this ride, so I will send this card to her. 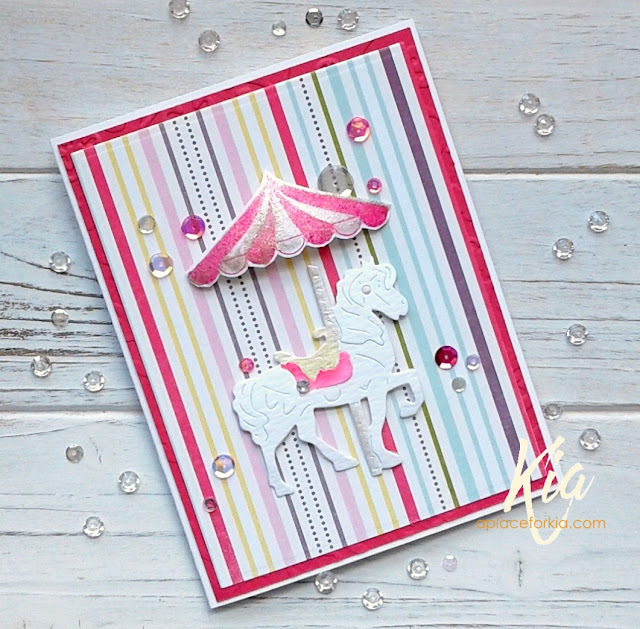 This Small Carousel Horse is part of the latest release by Frantic Stamper called Summer Carnival Fun. I wanted to use some fun papers so I die cut the horse in white and coloured only the saddle and pole, leaving the horse white, which I styled before attaching to the card on foam dots. I then stamped the awning from the Circus stamp set, which I coloured then added Wink of Stella for some shine. I finished with a scattering of sequins and gems for more sparkle. I think it is such a cute "little girl" card. Products: Frantic Stamper Small Carousel Horse, Frantic Stamper Circus Stamp Set, Tim Holtz Distress Markers, Neenah Cardstock, Echo Park Designer Paper, Wink of Stella, Sequins, Gems, Foam Dots. Balloons anyone! I hosted the Clean and Simple challenge on Monday and this is my sample card. added the twine and attached on foam dots. making such a happy place to create. Thanks for visiting, I will see you next time. Products: Simon Says Stamp Balloons Die Set, Simon Says Stamp Stitched Rectangles, Simon Says Stamp Extra Large Dots Stencil, Impression Obsession Birthday Wishes, Tim Holtz Distress Inks Carved Pumpkin, Evergreen Bough, Peacock Feathers, Neenah Cardstock, Vellum Paper, Clarity Brushes, Gold Embossing Powder, Twine, Sequins, Vellum Tape, Foam Dots. I do love the Ferris Wheel, and that is about the only ride I enjoy. Nice and peaceful with a great view ... works for me! This Ferris Wheel is from the latest Frantic Stamper release Carnival Summer Fun. I wanted my card to be a bit magical so I did a Bister background masking with a die cut of the Ferris Wheel and die cut another Ferris Wheel using gold glitter paper which I attached to my background on foam dots. I stamped the Birthday sentiment in black ink and added a few sequins to finish my "magical" theme. Products: Frantic Stamper Ferris Wheel Die, Frantic Stamper Circus Stamp Set, Neenah Cardstock, Ranger Watercolour Paper, Paper Garden Glitter Cardstock, Bister Powders, Simon Says Stamp Intense Black, Sequins, Red Crystal Gems. The Clean and Simple Challenge at Splitcoaststampers this week is to celebrate the colours of our countries flag. Canada's Flag Day is observed annually on February 15th to commemorate the inauguration of the Flag of Canada on that date in 1965. Previous to 1965, the Canadian Flag was the Canada Red Ensign which had been our Countries flag since 1868. There were four colours in the Red Ensign, which would have been fun ... but our flag is the Red Maple Leaf and red and white is the order of the day. 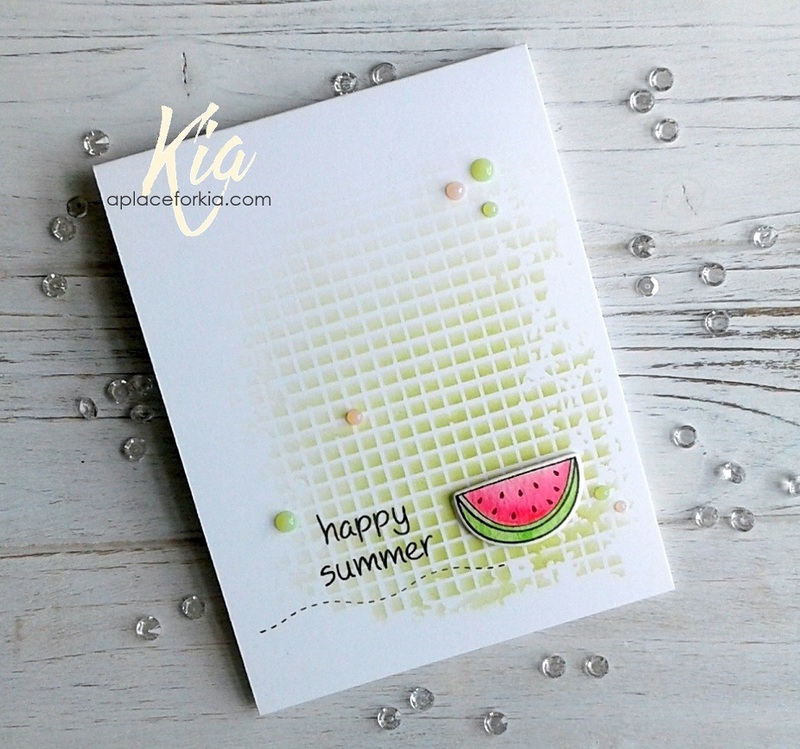 I decided on a fun and light summer card for the challenge starting with my flip flop embossing folder. I decided to highlight one pair of the flip flops, so die cut the red circle frame and added red and white twine to one side of the frame going around the back of the card, then attaching to the card base on foam strips. I coloured the flip flop in red and added a crystal gem to each. For my sentiment, I heat embossed using red embossing powder and die cut with the small stitched rectangle die and finished with a few sequins and crystal gems. I know just the person to send this to. Thanks for visiting today ... see you next time. Products: Echo Park Flip Flop Embossing Folder, Simon Says Stamp Stitched Circles, Simon Says Stamp Stitched Rectangles, Bakers Twine, Sequins, Red Crystal Gems, Red Embossing Powder, Embossing Ink, Foam Strips. 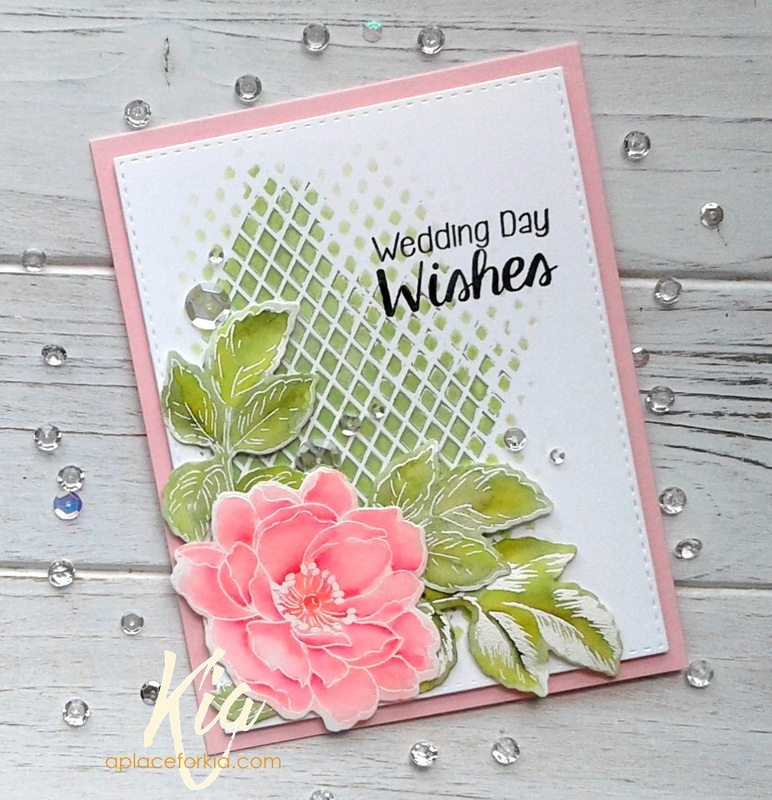 This card was a lot of fun to make, done for a customer who is having a September wedding and she would like thank you cards for her wedding party. Her decorating includes pumpkins in blue and ivory with gold accents, so I thought I would incorporate that into my card. I started with the beautiful stamp set by Altenew called Birch Land. It was the first set I bought from Altenew, and certainly has not been the last. I stamped the tree in black and did some masking to add to the tree on both layers. I then stamped the leaves, and did the brushing on of the green using my Clarity Brushes, which I love! I die cut the pumpkins and sponged on the blue and used gold Wink of Stella for the stems, styling and adding on foam dots for a couple of them. I stamped the sentiment, then attached the top layer on foam strips, adding Nuvo Jewel Drops to finish. I have given this card to Carol and she is very happy with it, so I can share it with you now. Thanks for visiting today. Products: Altenew Birch Land Stamp Set, Simon Says Stamp Thanks, Pumpkins are from the Frantic Stamper Fall Harvest Panel, Altenew Inks, Simon Says Stamp Intense Black, Neenah Cardstock, Foam Strips and dots, Nuvo Jewel Drops. This is the second thank you card I did for my customer. pale green and light green. which I am sure my customer will like. Thanks for having a look today ... see you next time! Products: Altenew Peony Bouquet, Frantic Stamper Chevron Edgers #1, Memory Box Scalloped Stitch Trimmings, Cuttlebug With Gratitude, Neenah Cardstock, Paper Garden Cardstock, Fabriano Hot Press Watercolour Paper, Sequins. It seems wedding cards and thank you cards are in need this time of year. A customer needs a couple of thank you cards to send out to some lady friends of his. I have made him cards previously, so I know what he will like, and this is one of the cards. I love this large flower stencil by Hero Arts, so decided I would use it for one of the cards. I brushed on the ink using my Clarity Brushes, and the results never disappoint. I love the way the brushes lay down the colour. Once done the brushing I added some Wink of Stella to the flower centre and stamped the sentiment in the bottom corner. I added a few sequins around the card and it was finished. A very quick and easy card thanks to the beautiful stencil and my Clarity Brushes. Products: Hero Arts Large Flower Stencil, Sentiment from Altenew Majestic Bloom, Neenah Cardstock, Tim Holtz Distress Ink Spiced Marmalade, Simon Says Stamp Intense Black Ink, Wink of Stella, Sequins. It is National Aquarium Month ~ who knew? 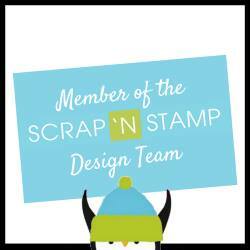 The Splitcoaststampers challenge today is celebrating, and this is my sample card. I used glitter cardstock for my water, and stencilled the blue on using a bubble stencil and Nuvo Mouse. Once that was dry I added glossy accents to the bubbles and put aside for that to dry. I stamped, die cut and styled the fishes, along with die cutting the top panel with the two dies and stamping with the seaweed in the blues. To put my card together, I first added the foam strips to my top panel and attached to the base, then arranged where I wanted my fish and attached them using foam dots. And, I added Wink of Stella to the fishes eyes, just because! Thanks for visiting my blog ... see you next time. Products: Hero Arts Coloring Layering Goldfish Stamp Set, Frantic Stamper Deckled Ovals Die Set, Simon Says Stamp Stitched Rectangles, Memory Box Bubbles Stencil, Neenah Cardstock, Paper Garden Glitter Cardstock, Altenew Inks Persian Blue and Caribbean Sky, Tim Holtz Distress Inks Wild Honey and Spiced Marmalade, Nuvo Embellishment Mouse Cornflower Blue, Glossy Accents, Wink of Stella, Foam Strips and Dots. then set it aside to dry. I stamped the flower and leaves on watercolour paper and heat embossed with white embossing powder, and water coloured using Zig Brushes. I attached the lattice panel to my card base using foam strips. I then styled the flower and leaves and arranged them on the lattice panel, attaching on foam dots. I never seem to know where I will stamp my sentiment until the end, and today was not any different. As I was going to be stamping partially on the mouse, I place the card in my Misti and stamped in intense black ink several times until I was happy with the results. Even though I stamped about 5 times, I still touched up the sentiment with a black fine line sharpie where I could still see the lattice. And, as weddings need a bit of sparkle, I added Wink of Stella to the flower centre along with a few clear sequins scattered around the card. Products: Memory Box Textured Diamond Stencil, Altenew Beautiful Day Stamp and Die Set, Frantic Stamper Wedding Wishes Stamp Set, Simon Says Stamp Stitched Rectangles Die Set, Nuvo Embellishment Mouse Spring Green, Zig Brushes Olive, Yellow, Carmine and Light Carmine, Neenah Cardstock, Paper Garden Cardstock, White Embossing Powder, Wink of Stella, Foam Strips and Dots, Sequins. 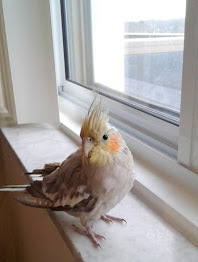 It is so true, the littlest birds do sing the sweetest songs. 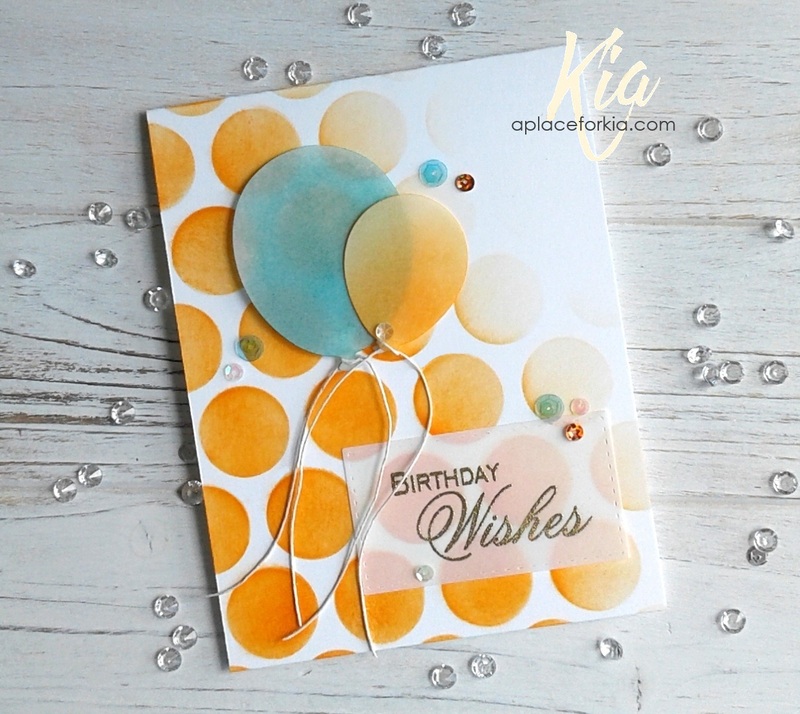 The inspiration for this card came from a Pinterest Board called Tim Holtz Inspiration. For those who do not know Tim Holtz, he is an artist/designer working with the Sizzix line of products and is very well known in this industry for his Distress Inks, which I used on this card today, as well as the stencil I used here. For this card I did the stencil monoprint technique using Tim Holtz Distress Ink Carved Pumpkin on Neenah cardstock instead of watercolour paper, which requires less water and less time left on the paper. Once the panel was dry I die cut using the stitched rectangle and sponged around the edges using Wild Honey Distress Ink. This stamp I bought awhile back, but this is the first time I have used it. It is from Carabelle Studio and is called Perroquets. 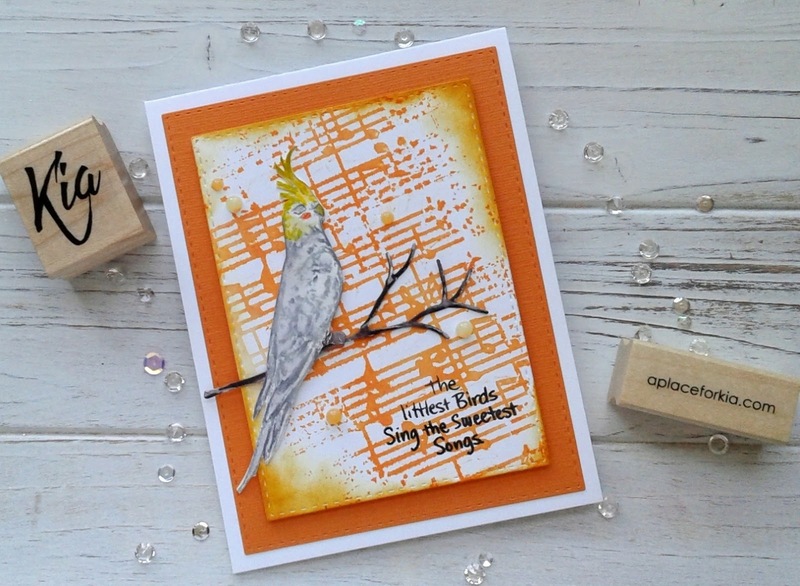 I have a Cinnamon Pied "Cockatiel" named "CC", which is why I bought the stamp, and as I made this card she was climbing all over me ... I am her "tree"! I stamped my bird in silver stone ink on watercolour paper and lightly watercoloured, adding the "Cockatiel" yellow and oranges and fussy cut once complete. I then stamped the sentiment on the music panel using Intense Black ink, added the orange cardstock which was die cut using the stitched rectangles and attached the music panel using foam strips. I styled the bird and attached the branch, which is watercoloured in the walnut, then attached those to the card on foam dots. 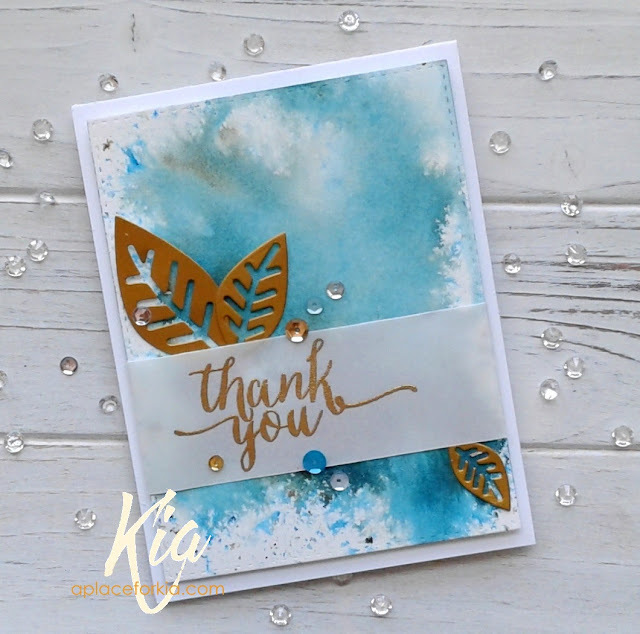 A few dots of Nuvo Jewel Drops finished my card. Products: Tim Holtz Stencil Concerto, Carabelle Studio Perroquets, Stampendous Spring Sentiments, Simon Says Stamp Stitched Rectangles, Memory Box Twigs and Berries, Tim Holtz Distress Inks Carved Pumpkin, Wild Honey, Walnut Stain, Neenah Cardstock, Fabriano Hot Press Watercolour Paper, Bazzill Cardstock, Nuvo Jewel Drops, Foam Strips and Foam Dots.